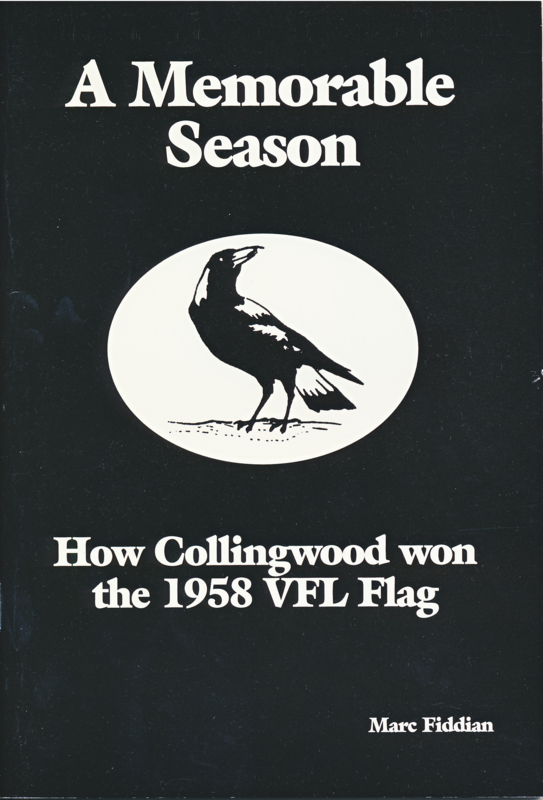 One of Collingwood's most cherished records is being the only club to win the League football premiership four years running. This record, set from 1927-30, was in danger of being equalled when Melbourne won in 1955-56-57 and up to the 1958 Grand Final was clearly the best team again. Collingwood played well enough to win that game by three goals and with it the premiership. The Magpies 'stole' the flag from Melbourne in one of the biggest upsets in the garne's history. This book analyses the path to the Grand Final week by week, and notes that Collingwood entered the fina1s with only one win against the other three finalists. In addition it had lost twice to fifth side Essendon. Fitzroy, the season's big improver, was regarded as a possible premier and Melbourne thought it a bigger threat than Collingwood. Indeed, Fitzroy's narrow loss to North Melbourne in the first semi-final was a relief to Melbourne. How then did. the Magpies win the title? Consistency during the season earned them a place in the finals and after a hiding from Melbourne in the second semi-final, they won the preliminary final against North Melbourne to earn a place in the Grand Final.